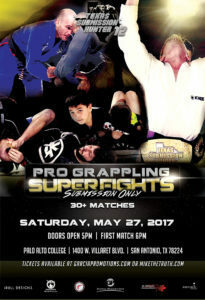 Texas Submission Hunter returns to San Antonio for Texas Submission Hunter 12. The event takes place at Palo Alto College on May 27. The card features 30+ matches with grapplers from the over the state. Get all of your Texas Submission Hunter 12 tickets here at MikeTheTruth.com. Check out the card below.